• Bounces, jumps, vibrates and shakes! • Infectious fun for all! 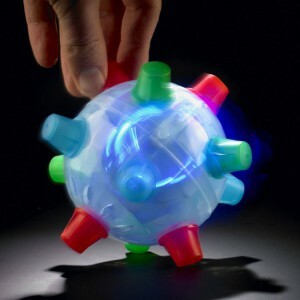 The Jumping Joggle Bopper is a sound sensitive, battery powered ball, that shakes and shudders across the room at random, all the while laughing like a maniac! the Joggle Bopper ball is a real live-wire, it combines intense flashing light and unpredictable movement, with both joggling and bopping for a near sensory-overload, it’s a jiggly, bouncy ball extravaganza! Once the joggle bopper starts laughing, the kids soon follow, and good luck calming them down once they're off! The joggle ball is great if you’ve got a less than happy little one, they’ll soon forget what they were crying about when the joggle bopper comes into play! Batteries provided free courtesy of us! Only with online purchase.